Hummer Emergency Radio - RD08 Guarantee for emergencies, just 2 minutes of cranking for 15 minutes of Hummer radio or 30 minutes of Emergency light from the Removable Flashlight. 3 watt audio output and three bank digital PLL tuner - AM, FM and Weather band (162.55Mkz). In emergency situations you can stay in touch with the digital AM/FM radio. And the included removable, rechargeable LED flashlight guarantees light in blackouts. HUMMER� radio is powered by hand cranking so you don't have to worry about depleted batteries when blackouts or emergencies hit. Removable LED flashlight provides up to 30 minutes of light. Features 12/24-hour clock with alarm, 90-minute sleep timer and LCD screen with LED backlight. The HUMMER Emergency Radio also features a removable storage box - great for an emergency kit (not included) - housed in the heavy duty, rubber grip cabinet. 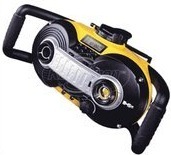 Crank power charges radio and flashlight. Digital AM/FM radio with 7 weather bands keeps you informed in emergencies. Removable, rechargeable LED flashlight guarantees light during blackouts. Auxiliary jack for MP3 player. Includes removable storage box for emergency kit.